I like clutter. I like my visual field to be jam-packed with stuff that sparkles or is brightly coloured or that I can look at and instantly conjure some memory of some time or place, whether real or fictional – I’m beginning to wonder how many of the things I remember actually happened and how many I invented or just read. In the recklessly unencumbered pre-baby era, Nick and I would spend many of our weekends flitting from brunch to thrift stores and flea markets, picking through piles of junk to find what we believed to be treasures. I once joked to my friend Dan that it wouldn’t be a big deal for us to move cross-country, as everything we own could be replaced in thrift stores when we got there. He agreed, which should probably be kind of insulting. I mean, some of our stuff is from Ikea, so it’s not all junk … right? One of my favourite cookbook finds to date came from the Cloverdale Flea Market, where we spent one sunny afternoon searching for more beer steins, kitten art, and light-up statues of Jesus. 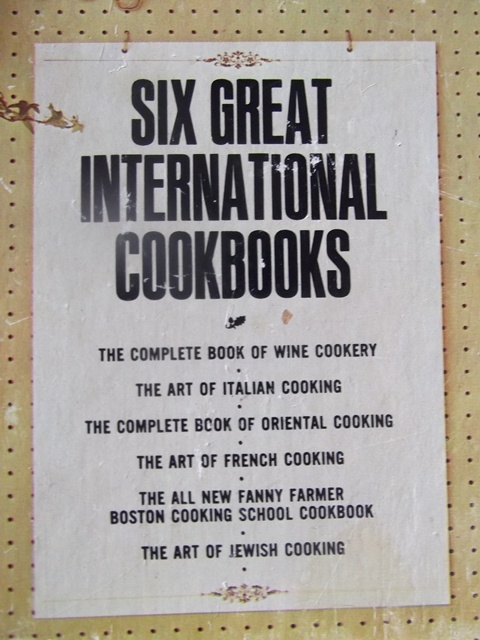 In a pile in the back of one man’s trailer, I found a collection of six paperback books on “international cuisine,” which continues to delight all these years later. 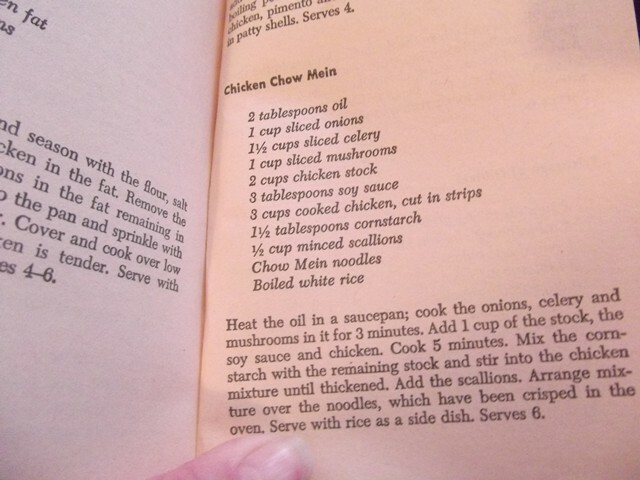 My favourite is the book on Jewish cookery, which does not contain a recipe for matzo ball soup, but which boasts recipes for both Cantonese Chicken and Chicken Chow Mein. 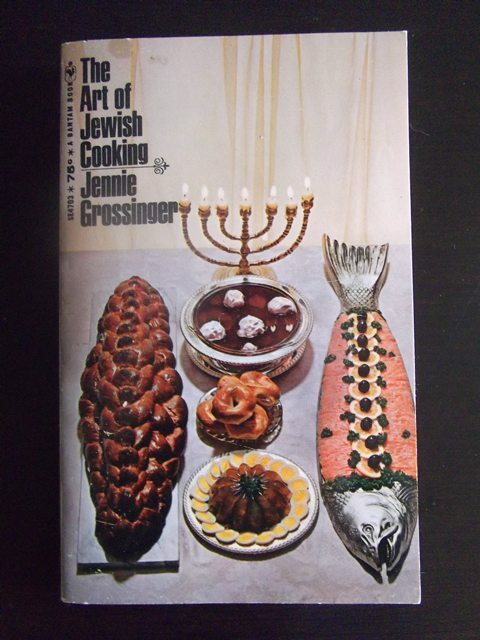 Not knowing a lot about Jewish food, this book has been my introduction to a cuisine that only seems to get airtime in December and April. And while I have yet to follow a recipe to the letter, a few recipes have been jumping-off points. One of these, for kasha varnishkes, is an excellent (if not beautiful) dish (“delicious and nourishing beige noodle mush” is a pretty accurate description) that uses pantry staples for a cheap starch alternative. Buckwheat is one of those super-healthy things you’re supposed to eat to lower cholesterol. It’s high in fibre, it’s cheap, and it’s quite tasty. And it has diverse applications – Food52 has a compiled a pretty thorough list. You can find roasted buckwheat groats, also known as kasha, at natural foods stores and Eastern European delis and groceries. 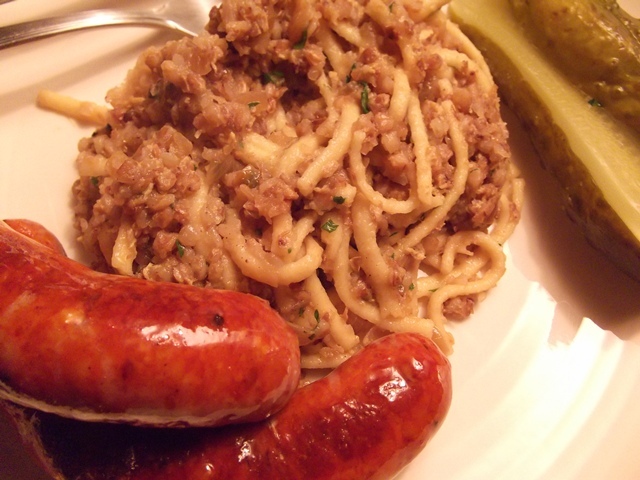 Kasha varnishkes are lightly sweet, thanks to the onion and apple, and are best served alongside sausages or roast meats and pickles, or with veggies for a full and hearty meal. You can use vegetable stock to make it vegetarian-friendly. 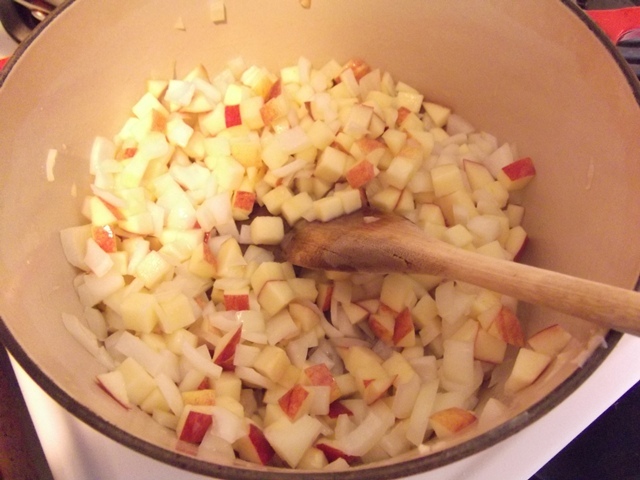 In a large, heavy-bottomed pot over medium-high heat, melt two tablespoons of butter and stir in apples and onions. Cover, cook ten minutes, then remove lid and reduce heat to medium. 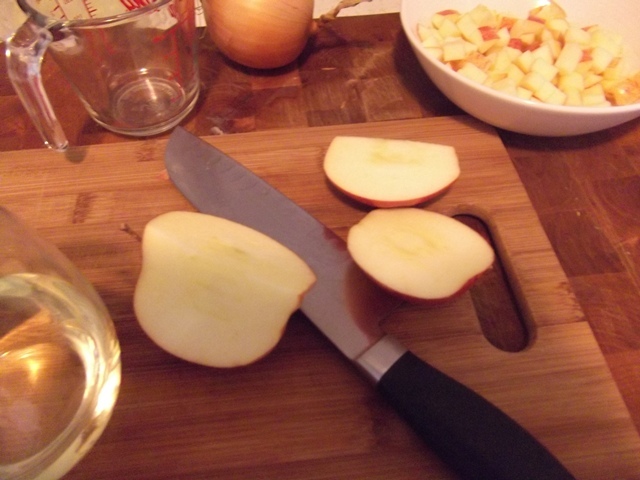 Stir frequently for 20 to 30 minutes, until apples and onions have caramelized and shrunk down considerably. Meanwhile, heat three tablespoons of butter in a pot over medium-high heat. In a bowl, stir buckwheat and egg until thoroughly combined. Pour into pot, stirring to keep groats from sticking together. Keep stirring until egg is cooked and appears dry. Add garlic, then chicken stock. 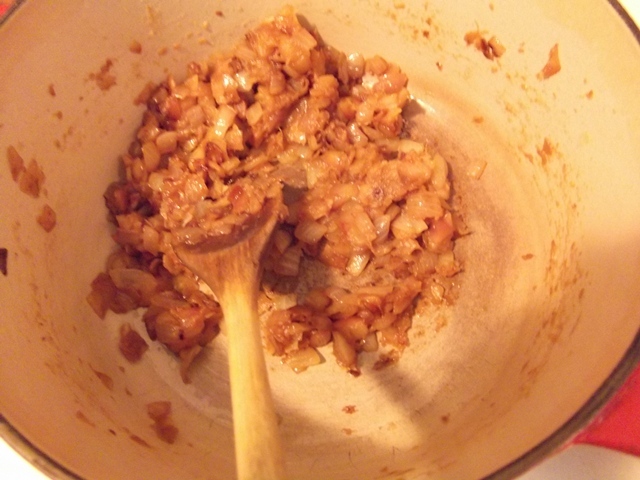 Reduce heat to medium and simmer until liquid is absorbed and groats are fluffy, about 15 minutes. In another pot, bring 2 1/2 cups of water to a rolling boil. 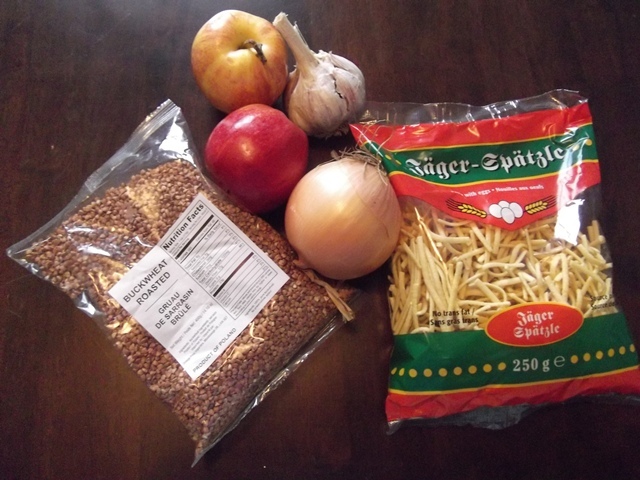 Add noodles, and cook until just al denté (refer to cook time on package). Drain. Stir cooked groats and drained pasta into the apple and onion mixture, add an additional tablespoon of butter, stirring to coat. Taste, adjusting seasonings as needed. Stir in parsley, and serve immediately.